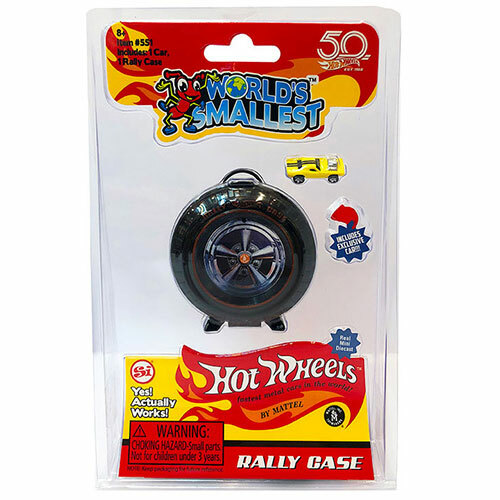 Fire up your inner race car driver and bring the dream to life with the World’s Smallest Hot Wheels. Series 2 expands the collection to now include classics Purple Passion, Fast Fish and Custom Otto! Proudly show off your collection of mini die cast World’s Smallest Hot Wheels cars with working wheels and collector’s box. Collect all 3! Are you someone who know lives and breathes cars? Do you consider yourself a master collector but can’t seem to afford them all? Well, now you can own 3 NEW classics, small enough to fit on a quarter! World’s Smallest Hot Wheels Series 3 brings you the option of owning your very own Rip Road, Night Shifter or Blitzspeeder. 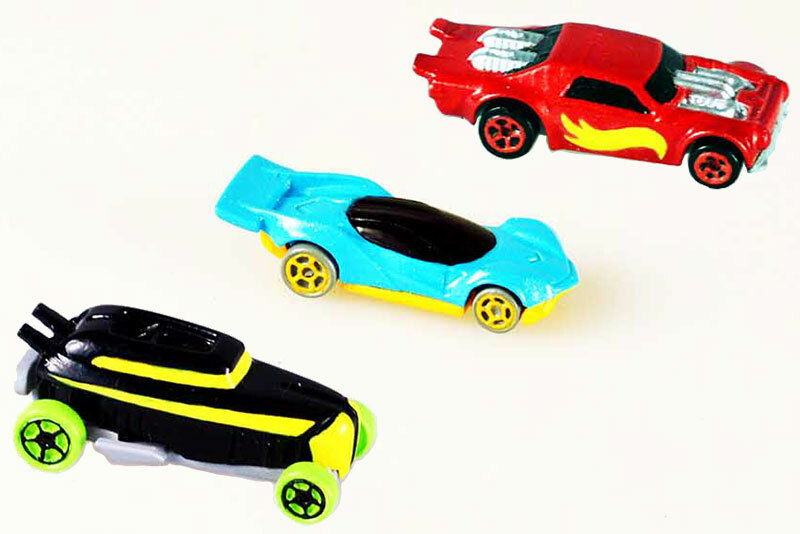 Made to last, with mini die cast and working wheels, these cars are Hot Wheels working replicas; a treat for a novice and car enthusiast alike! On your mark, get set, go! New from the world of mini Hot Wheels, race down the track, across the straight-away to the finish gate. Winner drops the checkered flag! Includes two World’s Smallest Hot Wheels cars, track, connectors and checked flag finish gate. Let your inner daredevil loose with this build-for-speed mini set! 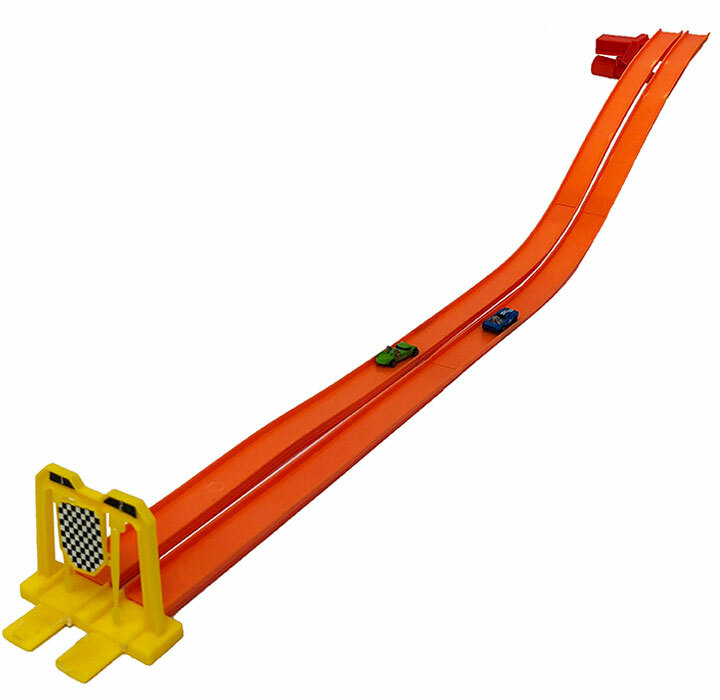 Race your World’s Smallest Hot Wheels down the track, around the curve, and off the ramp! It takes skill to set the track just right for the cars to manage the sharp curves. Generate enough speed to jump off the ramp! Includes one World’s Smallest Hot Wheels Car, track, clamps, connectors, curves and the jump ramp. Defy gravity with the world famous World’s Smallest Stunt Action Loop. 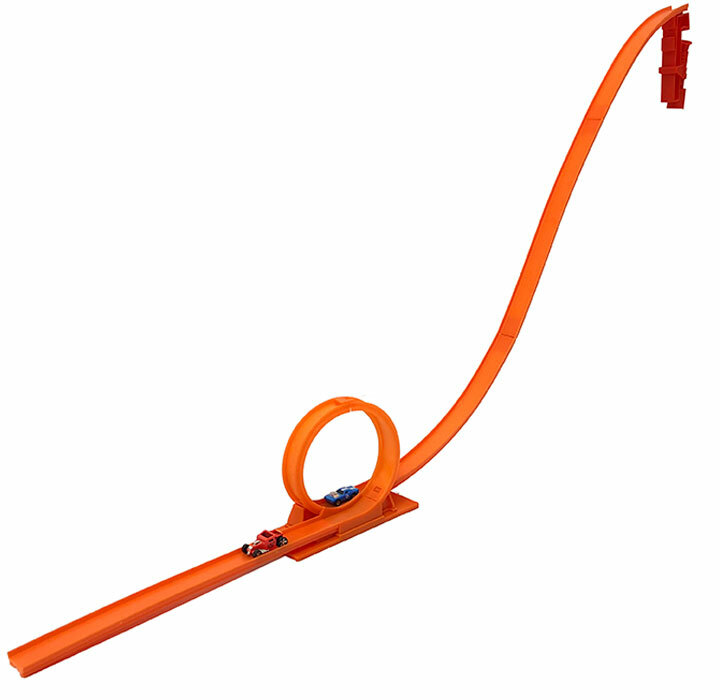 Featuring the most recognizable Hot Wheels track anywhere – the loop track! Set up the tracks for the best incline, to generate enough speed to make it around the loop! Can you do it? Challenge your friends to see who can master the course! 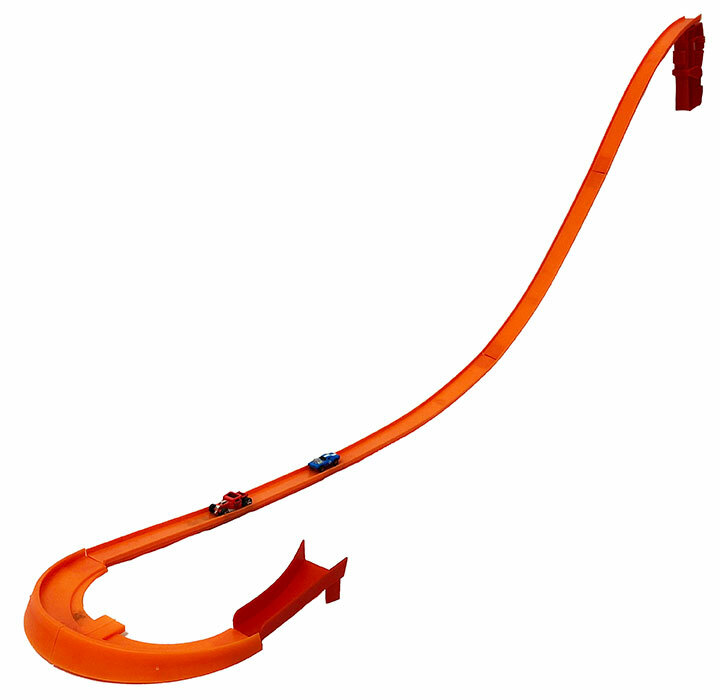 Includes one World’s Smallest Hot Wheels Car, Stunt Action Loop, track and connectors. 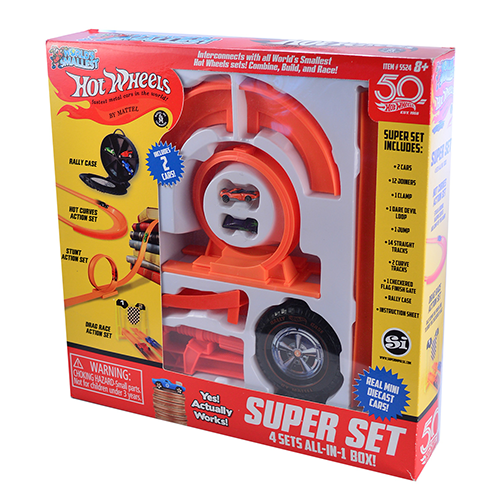 The World’s Smallest Hot Wheels Super Set includes all four sets of Hot Wheels tracks and accessories in one box. The Hot Wheels Super Set is available now and is sold exclusively at Cracker Barrel’s retail stores. 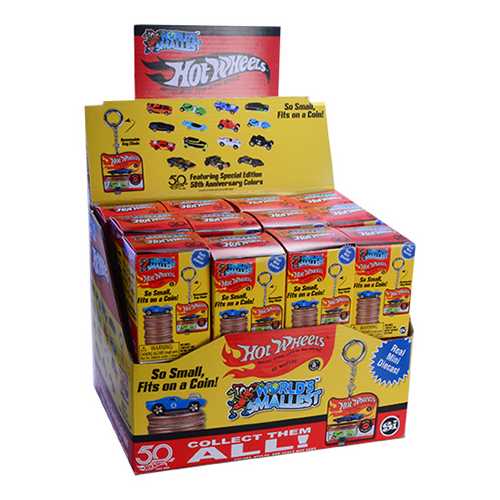 The World’s Smallest Hot Wheels Super Set features all of the World’s Smallest Hot Wheels track sets including the original Hot Curves Action Set, the Stunt Action Set, the Drag Race Action Set, the Rally case and two mini die-cast cars all in one incredible package. Introduced with the original 1968 collection, the Hot Wheels Rally Case was the ultimate carrying case to show off your Hot Wheels Collection. Super Impulse brings this icon back, sized to hold the World’s Smallest Hot Wheels Cars. Includes one car, with slots to hold 5 more! 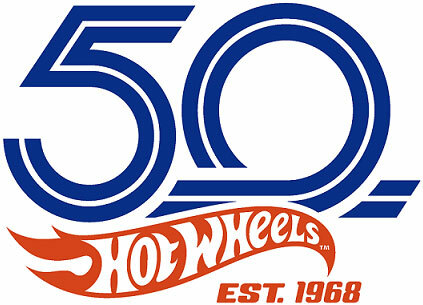 A special collection of miniature 1968-model Hot Wheels cars, packaged in a blind box format, are now available at Target. 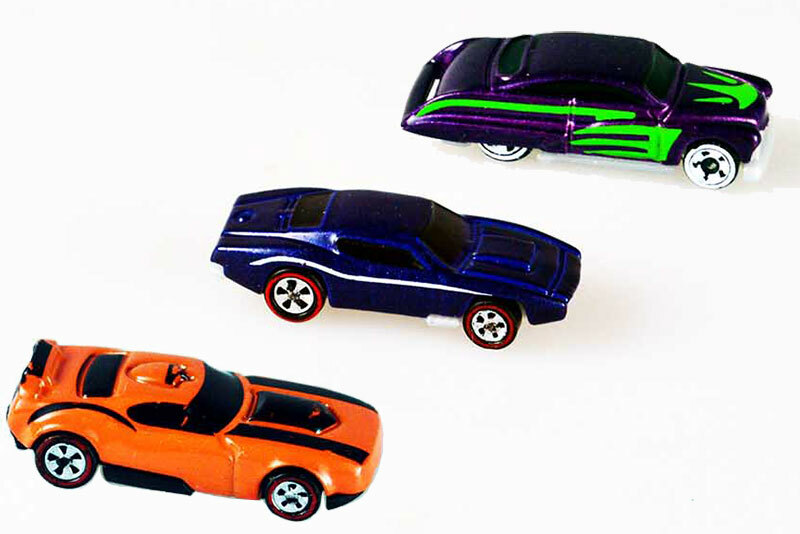 Each World’s Smallest Hot Wheels Blind Box includes one die-cast car packaged in a replica of the original 1968 blister card, that doubles as a display case with a keychain. Also featured in this special assortment are black and gold, ultra-rare, 50thanniversary commemorative editions, packaged in a unique black and gold blister card keychain that doubles as a display case. Hot Wheels fans of all ages will want to get their hands on these limited-edition cars!